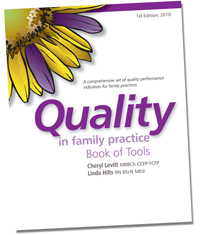 Canada’s first ever Quality Book of Tools is a comprehensive set of primary care indicators for family practices. Using this book will help family doctors and other primary care providers improve the quality of care in their practices. By Cheryl Levitt, family physician and Professor, Department of Family Medicine, McMaster University and Linda Hilts, family practice nurse and Assistant Professor, Department of Family Medicine, McMaster University. This Quality Book of Tools includes a conceptual framework of categories and values depicted in the Quality Flower, a yellow and purple sunflower chosen as a metaphor for the Quality Book of Tools.